Each kit is a bit different so expect some cutting and fitting. Also, I found that the order of assembly for my kit was somewhat different than what was specified in the kit. So I've found that it's wise to always be able to undo what has been done in case it needs to be taken apart again. Such was the case with installing some of the electronics. What I've written down so far is the way I would have put the kit together had I known then what I know now! But first, it's time for more painting. I've taped newspapers all over the BugE so I can now paint the inside of the upper body (don't forget to block the fan so paint doesn't spray up) I'm painting the inside of the cargo area white (so my future cargo is easier to see) and a neutral gray for the rest of the inside. In the photo, it's about half way primed. 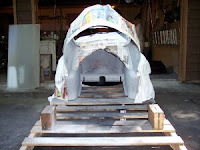 Originally, I was going to paint the inside with stone paint I had left from another project. However, the paint didn't look too good on a test piece of plastic and I also noticed that it was not good for outside use anyway. So I decided to just stay with the gray. I figure if I don't like it later, I can always go the spray-glue & fabric route. I used spray paint for this step but I would not recommend it. It's very messy, expensive (especially since I went through an expensive disposable respirator) and somewhat dangerous since I was painting in the confined area in front. If I was to do it again, I would just use paint from a can and dab it on with a sponge brush. I decided to leave the front door on since I think the white paint in the middle, leaving red fiberglass trim on the outside may look nice for the inside of the door. I also painted the bottom of the battery tray black. It's quick and boring so it didn't rate a photo. Enough painting! Now go back to the frame on the sawhorses and turn it over so it's right side up. The tail for the rear wheel now droops down and the front tires are still off the ground. I recommend mounting the electronics first, then installing the motor and rear wheel after that is done. As you see by this photo, the contactor mounted under the rear bumper-shock hump is a really tight fit. 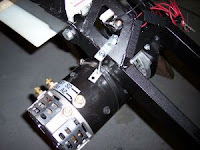 If the motor and tire were installed, I could not even position my arm there or drill the mounting holes! Also, once the contactor is installed, it is very hard to tighten the nuts on top to secure the smaller wires because of the confining space. So, it's much easier to pre-wire the contactor, put ends on them, then label the wires to show where they will eventually be connected. For reliability, all wire connectors have been soldered rather than crimped on. I don't want to take all this apart again due to a lose connection! Also, in the center, is a diode which has been wrapped in electric tape so it doesn't short against anything else. The lengths of wire are specified in the instruction manual and the circuit diagrams are excellent! Note, the big rectangular brown thing is a resister. I used one which has the same resistance but has a larger power capacity since that was what was available from my supplier. On the lower right of the left photo is the battery cut off switch with a removable red handle that serves as a primitive "key" for the BugE. On the right photo is the contactor once it has been installed, ready to accept two thick cables on the two large terminals. Here, you can see the speed controller which is mounted to a piece of white plastic under the front hump of the bumper-shock assembly. 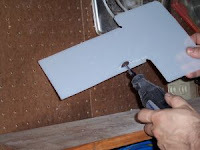 Use a jig saw or table saw to cut a board 7"x12" piece of 1/4" plastic or finished plywood. (I used an old plastic cutting board cut to size so I wouldn't need to paint it). 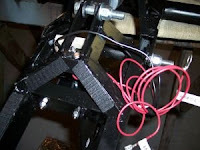 Mount the controller to the board using 4 - 1/4-20 x 3/4" bolts with the controller's row of spade connectors facing the rear of the vehicle. On my kit, the space was really tight for the controller so I used a grinder to grind off one side of the hex head bolts so the whole unit would fit inside the frame area. The board forms two shelves. 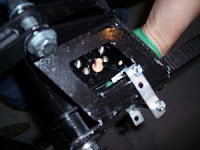 On the BugE models with the reversing motor, the near side would hold the reversing switch and the far side was supposed to hold two 48V chargers (more on this below). The frame is resting on some seats of some old chair cushions. I used these since I noticed using saw horses with no cushioning was destroying the paint every time the frame was set down on them. There is another issue that I think is specific only to my kit. I had no tab for attaching the hose clamp for a rear motor mount. I expect this was due to the welder forgetting to weld on the tab. I wasn't sure how critical this was to the design so I decided to construct a bracket and hose clamp arrangement to mimic the function of the missing tab. The hose clamp I used is a 5" to 6 1/2" size attached to a bracket of scrap metal and two bolts. A consequence of this is that the motor cover will now need to pass a bolt (probably using a hole and rubber grommet). However, there is a good side to this. The motor cover, secured in this way, is much less likely to fall off! Now, it's time to put on the wheel, motor and rear mud flap. The manual covers this rather well so I won't bore you with the details. However, I did take this pretty picture of some parts. 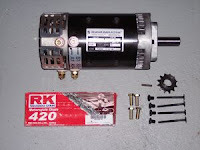 The MT-2109 motor from EV parts includes the sprocket, key & motor mount bolts. It fit the motor mount perfectly. The motor isn't too heavy but watch your back anyway. 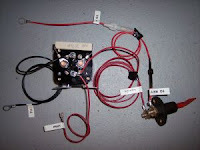 The red box is the drive chain that is included in the Bluesky light & control kit. The other flat bolts were also from the main kit and will be used to securely mount the battery tray to the frame. 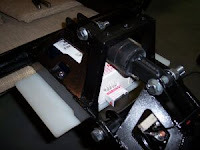 In the instructions, the motor cover is supposed to be held on to the swing-arm only by Velcro strips. While Velcro alone may work for a few weeks, eventually, the motor cover will vibrate off. In my case, when I hit a pothole. So, my motor cover now has an additional bolt & nylock nut that passes through the top of the motor cover and the rear wheel swing-arm. Since doing this modification, I've had no problems with the motor cover being lost. My kit came with the large gear already on the rear wheel. 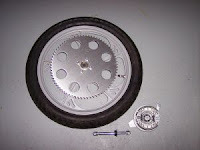 Pictured is the rear wheel assembly. Just like the front wheels, the rear wheels have drum brakes too. The axle is also included. When putting on the wheel, just be careful that the brake slot fits with the tab on the frame. When putting on the wheel, it sometimes wants to slip out until the bolts are tightened down. 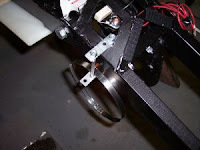 Now that the rear wheel is on, you need to connect it to the motor gear. To make the chain the proper size for doing this, it's just like how you would do it on a bicycle. Just use a block of wood and a hammer to force the rear wheel in on the frame. Then put on the chain & mark the link which would give the desired loop length. Grind off one side of that link so the chain is shorter. Then put in the provided master link so you have a loop. Then, use a block of wood and a hammer to force the rear tire out so the chain has some tension on it. I'm not sure how much chain tension is good nor the torque values on any bolts so I've been going on "feel". Providing torque values on critical parts such as the rear bolt would be a nice addition to the kit instructions. The motor cover and mud flap should be mounted last since they need to be removed to provide access to other parts if mounted earlier. When installing the mud flap and motor cover, I found I had to trim both to fit properly. However, they were both very easy to modify using a Dremil cutting wheel. Then I put on Self adhesive Velcro in various spots to hold these parts to the frame. Later, I resorted to an 8-32 bolt and a bent coat-hanger to hold the plastic piece against the motor wall. This solution is not too elegant, but it is effective. Since I'm doing the reversing motor option, the supplemental instructions show an image of two chargers stacked on top of each other instead of on either side as would be the case for the forward only motor plan. However, there is a problem with the instructions. I found the units included in the deluxe EVparts BugE kit were much larger than the ones pictured in the manual! So, I'm resorting to using a 48V external charging port instead and the shelf will now be used for mounting a DC-DC converter.